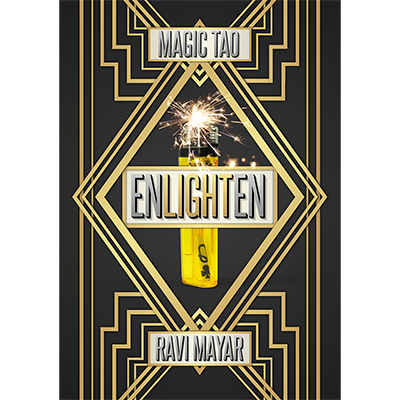 Enlighten showcases a stunning effect from the uniquely talented mind of Ravi Mayar (who has also created 'Real Counterfeit Money' and other celebrated tricks). A spectator selects a card. The performer tears off the card's corner, then withdraws a lighter and instructs the spectator to burn the corner, which vanishes in a spectacular flash of flames. The spectator is then asked to examine the lighter: to their delight and surprise, they discover the torn corner trapped inside the lighter itself! Of course, other amazing routines and variations are also possible using Enlighten. This improved version of Enlighten is packed with new information that will help you refine and enhance your performance. If you need a deep, highly variable routine with a show-stopping visual effect, Enlighten is perfect for you! "As soon as I saw Enlighten I KNEW I NEEDED it in my walk around set." "This effect is a pocket miracle with an everyday item that people can relate to. What more do you want." "Enlighten is something I've always got on me for those moments when I'm performing close up mentalism. Not only is it a great reveal but it's also an impossible souvenir."